Re-Post: Picky Eater | I'm not stalking you. Reposting as this is such a part of who I am. I was out to eat with some ex-coworkers recently at a nice restaurant someone had spontaneously suggested. I had no chance to research the menu online ahead of time, as I normally would. It turned out it was a seafood place. The typical conversation ensued as I looked at the menu. CO-WORKER: You should try the seafood blah-blah. It is really good. ME: I don’t eat seafood. CO-WORKER: Aren’t you a vegetarian? ME: No, I don’t eat vegetables either. CO-WORKER: Then what do you eat?…You’re a picky eater. I should have ended this exchange with “Pop Tarts”. But I didn’t. I admit, it is a little paraphrased. But I know how the conversation goes. I have had it a ton of times over the course of my life. And “You’re a picky eater” is always said as an accusation. I wonder if it is the same way people react when they find out someone is gay. * delicious strawberry flavored death! Now, I realize my “I EAT” column looks like it belongs to a toddler. But in truth, my toddler eats a more well-balanced diet than I do. But I have stayed alive all these years on this fine American processed food. And I grew another being while eating this food. You have to realize, being a picky eater isn’t a choice. I was born this way. It is a curse. It is a burden I must bear. Some of the foods I don’t eat I have tried and hate, like pineapple and coconut. Some smell so bad, I would never want to put them in my mouth, like seafood and coffee. Some I have never even tried and have no desire to, such as tea. SALESMAN: Would you like to try a sample of blah-blah tea today? ME: I don’t drink tea. SALESMAN: Oh, then you should try blah-blah. It has a very un-tea-like taste. ME (thinking): Um, if I don’t drink tea, then obviously I don’t know what it tastes like then, do I? Think of all the social situations that food plays a part in. I always had packed lunch at school because I wouldn’t eat the school lunch. 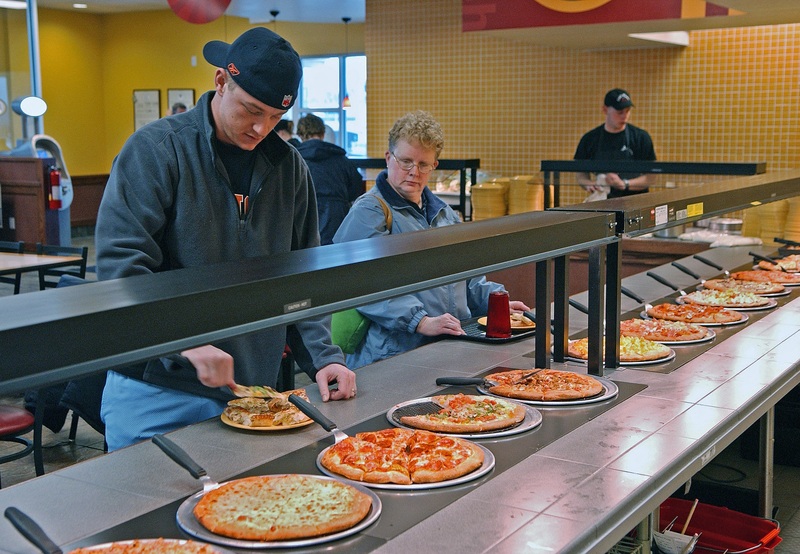 The entire four years I commuted to college, I never ate in the dining hall. (I used to get nachos from the snack bar occasionally, that was it.) At work, I rarely bought anything from the cafeteria. Potlucks are their own minefield. It is amazing how many dishes have hidden sausage or mayo or cream of mushroom soup. Recently, at a family event, I had the following exchange with an Aunt who is the most prim and proper person. She would believe she has excellent manners. AUNT: (looking at my plate) Is that ALL you are going to eat? AUNT: Are you a picky eater? AUNT: You don’t want any this or that? ME: I’m good. I found some things. Thanks. Isn’t it bad manners to make a guest feel bad about what is on their plate? Why no green pepper? I can’t ask. Heart racing, breath quickening. Cici’s Pizza is a nightmare for a picky eater with anxiety issues. Cici’s is a pizza buffet. They put out like 20 kinds of pizza at a time. But, of course, nothing for a picky eater. You can ask for any kind of pizza and they will make it for you and add it to the buffet. Except you have to be able to get past your anxiety and open your mouth and ask for it and not fear the rejection you expect to come. As a life-long picky eater, I worry the rest of the world wants to reform me. (I know, I worry too much.) That they want me to broaden my horizons. I feel like the world thinks if I am forced to eat something, I will like it and eat it forever and ever. It is another way I feel that I am different. That I am wired wrong. But I should stop thinking that way. Because everyone else has their issues. Some people overeat. Some people undereat. Some people smoke. Or drink. Or do street drugs. Or prescription drugs. Or run marathons. I don’t judge those people. (Well, I do judge the ones who run marathons. I judge them to be crazy.) Being a picky eater is my thing. Hey, I know. Let’s start calling it “selective eating”. That sounds more politically correct. Yes, I am not wired THAT much different than everyone else. I am just a selective eater. And addicted to caffeine. And I mis-match my socks. And I have issues with tissues. Posted in A day in the life and tagged adult, Anxiety, born this way, chicken nuggets, Cici's Pizza, Fringe, Jamie Oliver, not a choice, nutella, picky eater, Pop-Tarts, potluck, selective eater, selective eating, Walter. Bookmark the permalink.